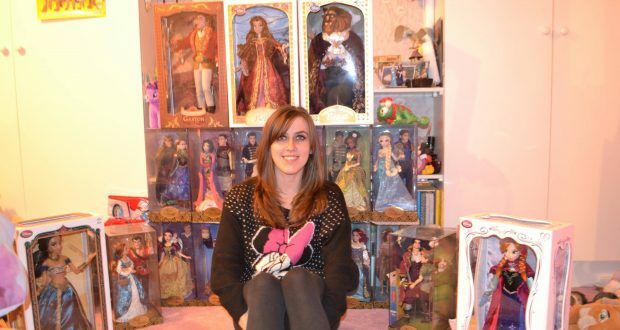 A KU student has spent over £1,000 on collectable Disney dolls, and her boyfriend dumped her for the expensive habit. Becca Tuffin has spent over £500 in the last month alone on the collectors’ items, and even took to the streets to camp out overnight to get her hands on a very special princess. The history student’s addiction to the collectables has not been smooth sailing though, as arguments over the expensive habit have driven a wedge in her relationship. Becca, 20, said: “My boyfriend and I have split up because we got into an argument after I camped out for 15 hours to buy Belle. I was shattered. I was miserable as hell, and he ended it because of one argument. It was horrendous. It is not just her significant other who has struggled to come to terms with the collection, as Becca and her dad stopped speaking for a week after she got her most recent doll. She started her collection two years ago after she joked about receiving one as a gift from her mother for her birthday. Since then, she has gone on to collect over 20 different Disney dolls – worth £1,000. The dolls are currently piled up on her bedroom floor. She vowed to stop her addiction this year, but cannot promise she will refrain in the future. Despite the destruction of some relationships, the addiction has opened up doorways to new friendships. The student said she was an amateur collector compared to some of the friends she has met. “My mates camped out for 26 hours to get a platinum edition that cost over £500. There’s nothing different about it either,” said Becca. The third year did not rule out selling the items off in the future. Meka Beresford studies Journalism at Kingston and is News Editor of The River. She enjoys the finer things in life; Buffy the Vampire Slayer, Wu-Tang and halloumi. During the weekends, Meka can be found writing for PinkNews.